What a gorgeous day to read and share books! 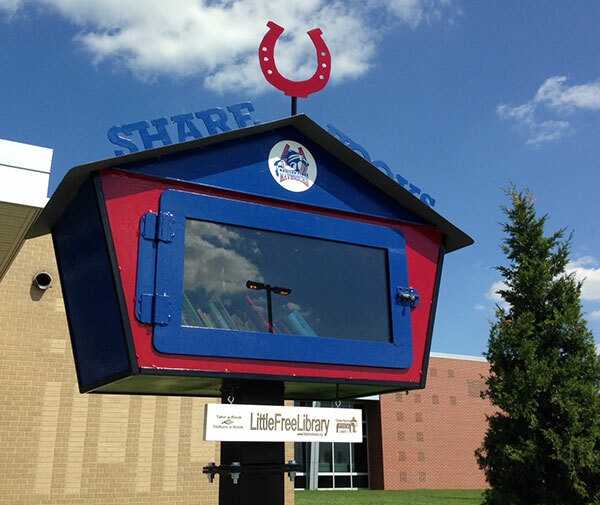 Today was the unveiling of the Madison Place Elementary (Olathe, Kan.) Little Free Library. The library is a legacy gift to the school from the 5th Grade class. The library showcases the school colors and their mascot: a maverick. The kids gave me drawings for inspiration, lots of horseshoes and horseheads. I incorporated the horseshoe...it spins! The Library can handle lots of books. The kids placed almost 80 books in it today. The Library is close to a new neighborhood. Perfect for walkers to check it out. Fun to have all the kids gather around the Library for a group photo. Thank you, Madison Place Elementary in Olathe, Kan.